Becoming a new parent can, it goes without saying, be extremely stressful and wouldn’t it be great to have a manual to hand which explains how to gain your inner calm back – and, better still, to pass that calmness onto your baby or toddler? by Maja Pitamic and Susannah Marriott” which would have been a great help to me when Caitlin and Ieuan were younger. I’m sure you have heard of the concept of mindfulness, which involves living in the present moment and directing your focus to whatever you are doing, thus removing your ability to worry and stress about things because it is impossible to do both at the same time. Believe me I’ve tried! There’s no doubt in my mind that parents pass their stresses, and their stress related behaviour on to their kids and, despite some recent media reports claiming mindfulness is not as effective as it’s claimed, my personal belief is that it is an extremely useful technique to use in all walks of life. New parenthood tests not only our bodies but particularly our minds. Nothing prepares you for the feelings you have when you become a parent and mindfulness is a great way of remaining calm and keeping a sense of perspective. 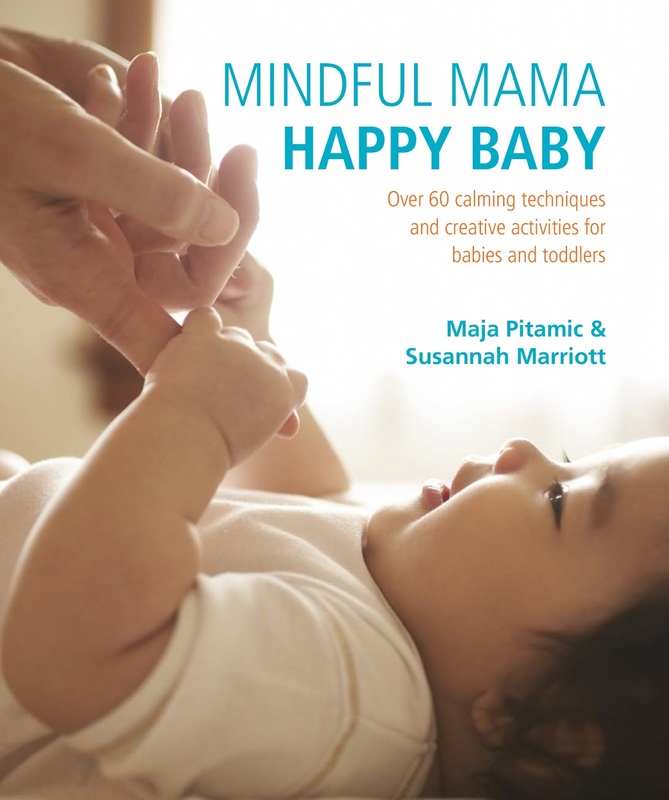 Mindful Mama: Happy Baby is a practical and accessible guide for new parents, designed to give you the skills to calmly navigate the early years of child rearing, from birth to three years of age. The authors say that ‘mindful parenting’ makes time for meaningful interactions with your child, which have a profound effect on bonding during the crucial developmental stages. Their techniques focus on the well-being of both parent and child, and help to bring peace and perspective to the emotional whirlwind of having a new baby. The activities in the book are suitable for children (both boys and girls) from birth to 3 and each chapter contains activities for a specific age group. The first chapter contains mindfulness meditations, visualisations and movement exercises to help you to adjust to your new role as a parent. The activities in subsequent chapters are based on Montessori principles of learning through experience. As your baby grows into a toddler, the exercises change to allow their particular age group to fully explore the world around them and engage their senses in a fun and playful way. Both practical and inspiring, Mindful Mama: Happy Baby gives you and your child the building blocks for an enjoyable and mindful first few years. I really like this book and it would make a great gift for a new parent, as well as being a worthwhile investment for yourself. Dads may benefit equally from the exercises too! Maja Pitamic is the author of I Can Do It, the successful Montessori activity book for ages three to five, as well as the co-author of I Can Make Music, Modern Art Adventures and 3D Art Adventures. Susannah Marriott is a freelance author and mother of three. Her books include Green Babycare, Natural Pregnancy, Pregnancy Herbal and The Pregnancy and Baby Book. You can order Mindful Mama: Happy Baby (£12.99) from www.amazon.co.uk/Mindful-Mama-Techniques-Creative-Activities/dp/1906761833 or by telephoning the publisher, Modern Books, on 01256 302 692. "Get Ready For School With Nadiya’s Lunch Box Hacks"